their experiences with the evopen and evoOTware. rom buyers and users of the product, evoOtware. A proud inventor. Of all the writing devices currently on the market, I believe the evo.pen is the most unique, affordable and most intelligently designed for adaptive use." Ms. Mary Benbow, MS, OTR, La Jolla, CA. ...Author of the Chapter "Principles and Practices of Teaching Handwriting" in the Mosby Medical Text, Hand Function and the Child. "An evaluation of this product by a panel of health care professionals, consumers and foundation staff found this wide grip pen fits snugly in the palm of the hand and is contoured to the shape of the fingers, which makes it easier to use." Jerry G. Langley, Chairman, Arthritis Foundation, Atlanta, Georgia...the evo.pen was the first pen to be awarded a Commendation from the Arthritis Foundation. I wanted to send you a letter of thanks for sending me some sample pens. We have had several patients that were able to benefit from your ergonomic pens and had improvement in both comfort and stamina. Dr. Lifchez and I are grateful in your assistance in the care for our patients. 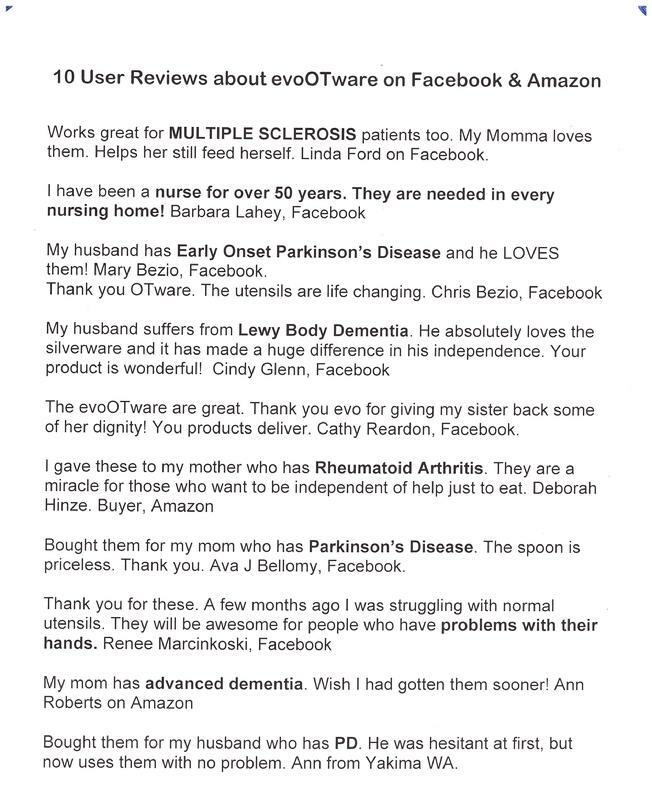 My evo.pen is the most comfortable pen I've ever encountered and I don't have arthritis." "The evo.pen is a viable alternative to writing with the standard stick pen. It is designed to fit in the natural closing grip of the hand." Journal of the American Occupational Therapy Association. "This ergonomic gripping shape makes it easier to write, and is ideal for persons with arthritis or limited mobility." "I dare to think that at last I have a writing instrument I can use." Louine King, Architect, Avon, CT.
"They are wonderful!! The degree of comfort in writing is readily apparent." Pierre Rioux, M.D. Minot, N.D.
"The pen is helping many people with different kinds of grasping problems." "I suffer from Carpel Tunnel Syndrome and received one of your pens. They are great!"